A Gazebo is a freestanding structure, which apart from providing shelter and shade, also adds great ornamental value to the landscape of a property. Finishing off the structure with tailor made Gazebo blinds is perfect for covering your Gazebos and protecting the space from the elements. Often, clear pvc plastic blinds are a popular choice as it allows views of your surrouding backyard or gardens. Not only are they aesthetic, but also help weatherproof the interior of your gazebos from harsh climatic conditions, keeping away insects and keep the space as temperate as possible. 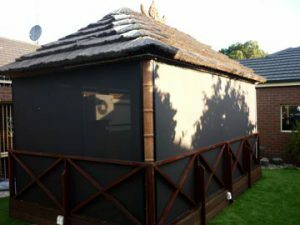 In fact, it’s one of the cheapest ways to extend your house without the need for structural wall supports. Ask us to come to your home and scope out your Gazebo so we can recommend the best option for your needs. 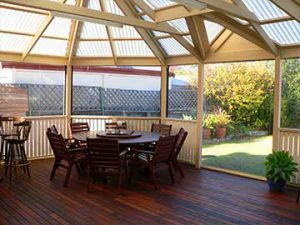 Blinds for gazebos are the natural choice which allows you to enjoy the outdoors while living comfortably whether it’s in Sydney or Melbourne. To get gazebo blinds in various colors and hues or the tinted blinds of your choice, contact us today.